This chapter provides educators instructional methods for teaching audience analysis to students in professional writing courses. It argues that a rhetorical approach to the teaching of professional writing, focused on audience analysis, allows students to learn how to engage and become members of their audience’s discourse community. This engagement allows the writer to better conceptualize the audience and their needs, facilitating improved communication practices. The author hopes that such an approach will prepare professional writers for their future careers, be it in a traditional or virtual workplace, by gaining a recognition of the different levels of expertise of audience members. Scientific Accommodation: The transmission of scientific information from expert to nonexpert audiences. Web Log: An electronic publication of thoughts and links whose entries appear in reverse chronological order (also known as a Blog). Discourse Community: Individuals who use a particular form of communication that contributes to shared values. Audience Analysis: The writer’s determination of the intended or perceived audience. Rhetoric: The technique of persuasion through written or spoken language. Wiki: A collaborative technology for organizing Web site information. Distance Education: The delivery of course materials in a virtual environment. 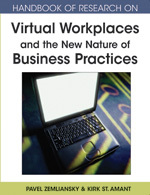 Virtual Workplace: A workplace not located in a physical space.